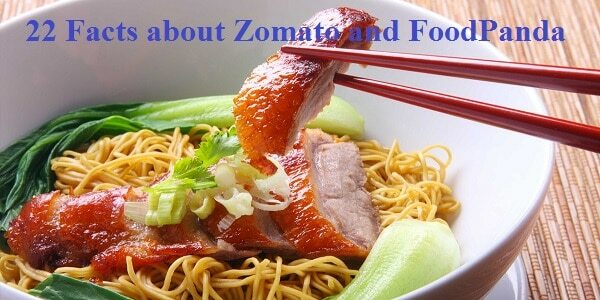 1) In November 2010, Foodiebay was renamed to Zomato. 2) Zomato has partnered with more than 4000 restaurants in India. 3) Number of restaurants listed on Zomato has grown upto 284,500. 4) Zomato is available in 100 of Indian cities. 5) Number of monthly users on Zomato platform has reached upto 19 million. 6) Zomato lists over 1 million restaurants across 23 countries. 7) Zomato is available in 9 international languages. 8) Zomato now attracts more than 90 million monthly visitors. 9) Till date Zomato has grabbed a total of $225 million in funding. 10) Number of Facebook fans for Zomato is 1.27 million. 11) Zomato covers over a million restaurants across 10,000+ cities in 23 countries. 1) FoodPanda has partnered with more than 15,000 restaurants in India. 2) FoodPanda operates in more than 501 Indian cities. 3) Daily unique visitors on the FoodPanda platform are 10,000. 4) FoodPanda’s total funding till date is $318 million. 5) FoodPanda globally has its employee base of 1200. 6) FoodPanda operates in 40 different countries worldwide. 7) FoodPanda has partnered with 580,000 restaurants globally. 8) FoodPanda operates in 14 Asian countries. 9) FoodPanda’s net revenue in H1 2015 was EUR 13.4 million. 10) Online order through FoodPanda in H1 2015 was 9.1 million. 11) FoodPanda has 1.87 million fans over its Facebook fan page.